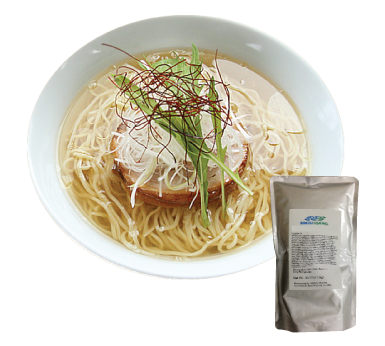 Ingredients: Water, Soy Sauce, Salt, Chicken Broth, Sugar, Pork Fat, Pork Extract, Bonito Extract, Monosodium Glutamate, Canola Oil, Sardine Extract, Sugar Alcohol, Hydrogenated Starch Hydrolysates, Yeast Extract, Chicken Fat, Natural Flavor Enhancer, Yeast Extract, Pork Stock, Poultry Flavor, Natural Flavor, Vegetable Extract, Fish Extract, Hydrolyzed Vegetable Protein, Bonito Powder, Garlic Powder, Ginger Powder, Xanthan Gum, Vinegar, Sodium Inosinate, Black Pepper, Disodium Guanylate. Allergens: Fish (Bonito, Sardine), Wheat, Soybean. 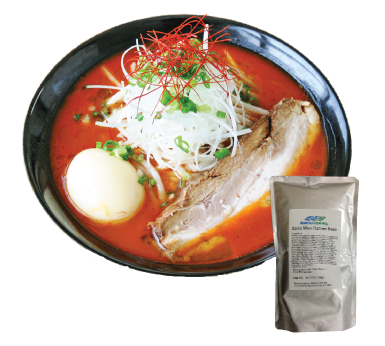 Ingredients: Miso (Soybean, Rice, Salt, Alcohol), Spicy Toasted Sesame Oil, Pork Fat, Sugar, Hot Pepper Paste, Corn Syrup, Hot Pepper Powder, Soybean Paste, Red Pepper, Soy sauce, Hulled Sesame Seeds, Salt, Chicken Broth, Pork Extract, Garlic, Water, Hydrolyzed Soy Protein, Yeast Extract, Natural Flavor Enhancer, Garlic Powder, Pork Flavor, Ginger Powder, White Pepper, Caramel Color, Black Pepper, Japanese Pepper.